Here are some more high resolution pictures of my completed butler robot. Today I finally finished my wireless colored lights that are controlled with bluetooth. I used the BlueSMIRF Gold on one of the Axon's UART lines and wrote up a program that "listens" on the BlueSMIRFs Rx line ( the line where the incoming serial data is) for the key presses. There are four colors of LEDs and each is controlled by the first letter of the color ( the code for white is "w" ). I used ZTerm on MacOSX as the terminal emulator . It has extremely long range as well - I can control the lights from the second floor when the lights are in the basement. I played around with the BRAT biped robot and the Axon and I finally got it to walk. The gait is not perfect yet but its a start. The servo position calculator program the I made really helped me out. The entire program was made in C and the timing for the servo is cycles based. The Axon is a really powerful microcontroller board and its extremely easy to use. More updates to come within the next week when I perfect the gait and add on an accelerometer. I've been working on my biped for about a week now and it was getting annoying to figure out the amount of cycles needed each time. So I developed a servo position calculator that calculates the angle, cycles delay,milliseconds delay, and microseconds delay for a servo when given at least one variable. It even visually displays the turn of the servo onscreen. Heres a quick list of what I am currently working on and what to expect from me in the next couple of weeks. 3. I'll be documenting my small scale BRAT biped robot. I was shocked to see that not one person posted up any documentation on using that biped robot with any microcontroller board besides the included Atom Bot Board which uses BASIC. 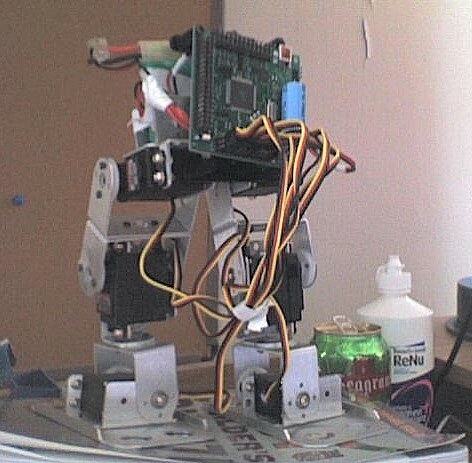 I'll be documenting how to use the BRAT biped with the Axon microcontroller which uses C.
Heres a pic of my biped robot with the Axon microcontroller board mounted on. I just ordered a whole lot of new parts I have been aching to get ever since I started doing work in robotics. I bought a BlueSmirf Gold Module, an RF link Module , 3 axis accelerometer , digital compass, USB to RS232 Adapter, RS-232 to IDC adapter, some high power LEDS, and a BRAT bipedal robot kit. Can't wait until I get to play with all these parts. Also, if any readers have any cool projects they've built lately , send me an email and I'll post a link to your project from my site. My latest personal project is a giant biped robot for me to ride on. This is probably the most ambitious project I have ever undertaken and I expect it to be done by next year. 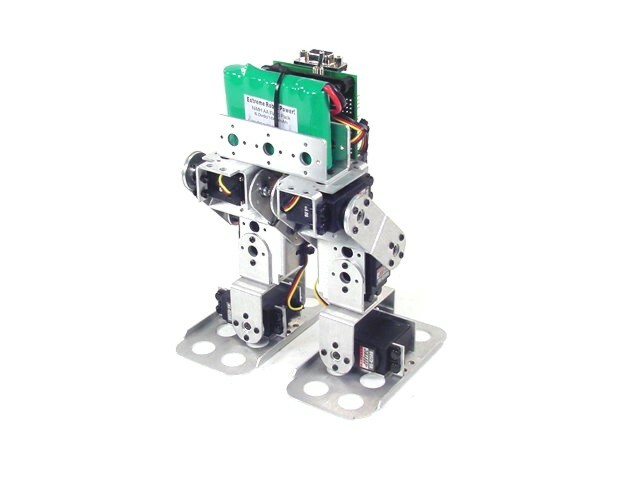 The biped robot will be a dynamic balancer and will be 5 to 6ft tall , plus another few feet taller with me sitting on it. Its been a while since I've last updated this blog - way too busy with designing projects. Anyway my robot butler robot tutorial was a finalist in the Instructables Contest and was also a finalist in the Trossen Robotics Contest. Basically I won T-shirts and a Gift Certificate. I'll keep on entering Chives into more robot contests that turn up in the future.